What: Back for another year! This is not just another board game party! Featuring thousands of dollars in prizes from the gaming and food industry, life-sized versions of some of your favorite games, food, drinks and the chance to match wits with some of the nation's best game designers, this is THE party to be at on the night before PAX! Every cent - that's EVERY. RED. CENT. 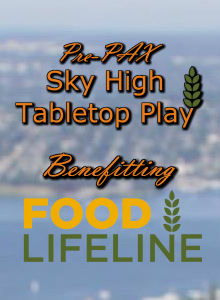 - that we raise on this evening (beyond the costs of producing the event) will be donated to Food Lifeline. Rated by Charity Navigator as 4-star charity, they provide food for homeless people in Western Washington and across the nation. Oh, and it takes place in a swanky private club atop the tallest building in Seattle. A pop-up game store (from The Dreaming Comics and Games) to make acquisitions, if you so choose. A ticket-based drawing, with prizes including gift cards to many of Seattle's best restaurants, tabletop games - and, oh yes, PAX badges in case you struck out and want to go. As all monies spent are going to Food Lifeline, all monies spent are 100% tax deductible. Gaming Vouchers: The Dreaming Comics and Games will have a pop-up store at the event where you can purchase games! You have the option of purchasing 2 $10 gaming vouchers with your ticket for only an additional $5! What these vouchers allow you to do is take $10 off of any one game priced at $30 or more. We also did this at International TableTop Day, and it was a huge success. Here's the proverbial fine print: Vouchers only have full effect on games costing $30 or more. Vouchers can be used on games priced below $30, but the lowest price a voucher can reduce the price to is $20. For example, a voucher used on a game costing $35 reduces the price to $25. A voucher used on a game costing $30 reduces the price to $20. A voucher used on a game costing $25 reduces the price to $20. A voucher used on a game costing $18 has no effect. Also, you cannot use multiple vouchers on the same game. More info can be found on our FAQ.